Chicken fillet with mushrooms in cream sauce is easy to prepare and a deep, rich flavor. Fragrant mushrooms are interspersed with delicate taste of chicken. And most importantly: the preparation of the dish takes only 25 minutes! 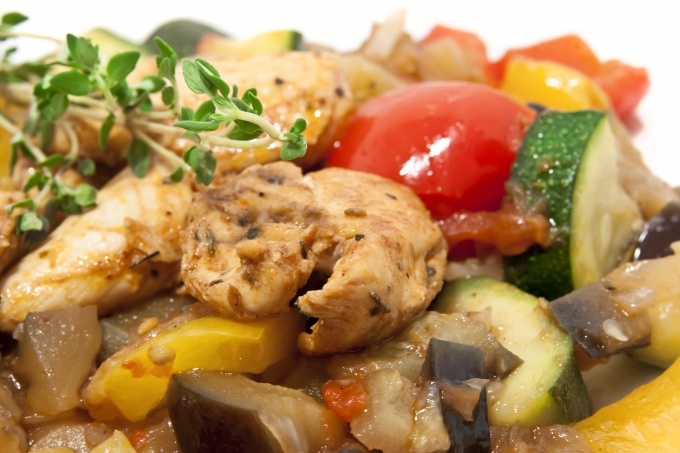 Chicken fillet with mushrooms - great option for dinner. The meat is soft and juicy, and the mushrooms especially flavorful. To cook this delicious dish will be a snap even the young mistress. Wash chicken fillet, lightly whisk it with a rolling pin, season with salt and pepper. Instead of chicken you can take a Turkey breast, the cooking time will increase by 5 minutes. Fillet put under the film. Onions clean, finely macrosite. Wash the mushrooms or oyster mushrooms. Slice the mushrooms crosswise into 4 pieces, oyster mushrooms chopped, thick strips. It is important not to cut mushrooms too finely, so that in the finished dish they are well felt. The small mushrooms leave whole. Chicken put in a deep pan and fry in vegetable oil on both sides until Golden brown. Put in a bowl. In the same pan saute the onion and mushrooms for 5 minutes. Long to fry the mushrooms and oyster mushrooms or they will become rubbery. For a recipe will fit other forest mushrooms or frozen, but not dry. Sauté them until tender. Pour the flour on the mushrooms, stirring thoroughly. After half a minute pour in the pan with the mushroom broth. Stir and add a few spoons of thick cream. Instead of broth you can take the broth made with half a chicken cube. Season with a little salt dish and bring to a boil. The soup cube additional salt is not necessary. In boiling on a slow fire sauce put fried chicken. Simmer for 10-15 minutes under the lid. For a couple of minutes until cooked sprinkle the dish with chopped parsley and dill. The feeding dish on the table, decorate it with lettuce leaves, thyme and Basil. As a garnish to the dish is well suited boiled potatoes or spaghetti. The sauce goes well with any not very juicy side dish. Serve the dish on the table not very hot, so the sauce thickens a bit. Baked chicken breast is a useful and delicate dish that has many variations and is suited to any garnish. "Coat" for such a fillet can think of, based on the products that are at hand. Chicken fillet with mushroomsbaked in the oven - a good choice of hot dishes for the festive table, because it looks nice, is cooked simply and eaten with great pleasure! 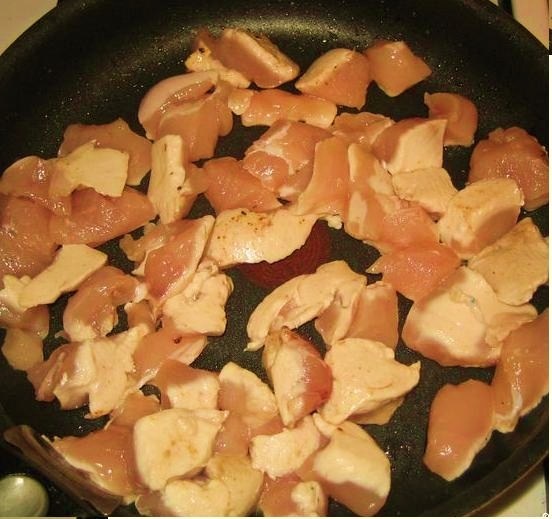 Fresh cut chicken breast into serving pieces. Place the pieces in a plastic bag, to avoid splashing, and slightly repel. Then season with a little salt and pepper, put in a deep bowl and pour cream or milk for 15-20 minutes. In vegetable oil fry the chopped onion and pre-cooked fresh mushrooms. Grate cheese. Soaked the fillets lay on a sheet, greased with vegetable oil. You can use paper for baking. On each piece of fillet lay the fried onions and mushrooms, then sprinkle cheese over top and gently spread with mayonnaise. Put the sheet in a well-heated oven and bake for about 30 minutes at 180-200 degrees. When serving, garnish with sprigs of parsley or dill. Be sure to watch that the fillets don't dry it in the oven and didn't lose its delicate flavor! Instead of milk you can soak the fillets in mayonnaise, and instead of fresh mushrooms you can use pickled mushrooms or cucumbers. The exquisite taste of the chicken will give a circle of canned pineapple stacked on top of the "coat". Chicken always turns out very juicy and tender. Chicken is a beautiful combination of cream, cheese and mushrooms. To cook this dish is quite simple: it is suitable for both everyday and festive table. Cook chicken in the oven with the mushrooms. black pepper, salt, optional and to taste. Preparation of this dish, you must start with the fact that the chicken breast should be cut into portions, having a thickness of approximately 1 centimeter. Fillets are best cut into pieces across their fibers, then lightly with a meat tenderizer. You can do it as a special hammer, and the reverse side of the knife. Put the prepared meat on a baking sheet, greased with vegetable or butter. Meanwhile, prepare the mushrooms (you can use as the mushrooms, and oyster mushrooms): slice their plates, or other small pieces. Onions wash, peel and cut into thin half-rings. Parsley wash and finely chop. Connect the mushrooms, parsley, onion, cheese, worn on a medium grater, mayonnaise, sour cream, and add the required amount of salt and pepper according to your taste. The cheese-mushroom mixture, place on each piece of chicken and then send the pan in the oven to bake at 180-200 degrees until Golden brown for 30 minutes. 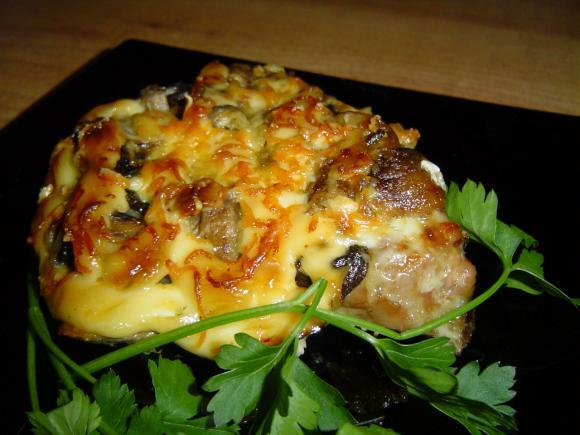 Chicken fillet, oven baked with mushrooms and cheese, fully prepared, and it can bring to the table.